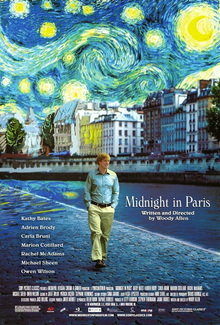 Midnight in Paris, the latest chapter in Woody Allen’s ongoing Euro-travelogue, commences with an old-fashioned overture—a lengthy montage of postcard-pretty Parisian street scenes set to a Sidney Bechet clarinet number—hearkening back to the opening scenes of Manhattan (1977), the Woodman’s swoony, romantic ode to NYC. Steeping himself in European locations for the last half decade hasn’t so much compelled Woody to forge new material, as it has encouraged him to approach longstanding preoccupations from a foreign perspective. Cultural cross-pollination isn’t just Woody’s latest modus operandi; it’s also one of Midnight’s overarching themes. Situating a familiar constellation of Woody Allen stock characters—the indecisive, lovelorn and –torn protagonist (Owen Wilson, whose troubled personal history adds an affecting layer of vulnerability to his performance) who suffers the slings and arrows of indignity at the hands of his shrewish fiancée (Rachel McAdams) and slave-to-status, presumptive in-laws (Kurt Fuller, Mimi Kennedy)—against unfamiliar surroundings generates the majority of the film’s fish-out-of-water gags, whether they’re social-political (Gil’s persistent potshots at his future in-laws’ Tea Party leanings) or cultural (Michael Sheen’s bearded blowhard correcting a tour guide on the fine points of Rodin’s love life). At this point in his six-decade career, Woody can write that sort of material in his sleep, and while it doesn’t negate the few hearty chuckles these jokes elicit, the thematic heart and soul of the film rests with what he designates “golden age thinking,” the unshakeable sensation haunting aspiring novelist (and erstwhile Hollywood screenwriting hack) Gil Pender that life would have been more satisfying if only he had lived in some ideal, bygone era. In Midnight’s central conceit, Gil wanders the streets in a drunken stupor until, at the stroke of (you guessed it!) midnight, a vintage Rolls crowded with revelers pulls up at the cobblestone curb to whisk Gil back to the 1920s, the fabled era of the expatriate Lost Generation, where he soon finds himself keeping company with the likes of Hemingway, Scott and Zelda Fitzgerald and Gertrude Stein (Kathy Bates). These stand-ins not only permit Woody to drop some tidbits of cultural and historical knowledge, they also serve as sounding-boards for Gil, allowing him to bounce his meager stock of ideas off his literary idols. It’s a good thing, as it turns out, that their rather surprising goodwill and encouragement do not simply lead to a warm ego-bath for Gil (and, by extension, Allen the auteur). What could so easily have come across as portentous and heavy-handed just about breezes past under Woody’s (for once, of late) deft touch. Parenthetically, my favorite bit of historical revisionism must be the scenes where Gil meets up with the Surrealist cohort of Salvador Dali, Man Ray and the inimitable Luis Buñuel. Gil at one point inadvertently suggests the scenario for Exterminating Angel (1962) to a bewildered Buñuel. Probably it’s no coincidence that one of Buñuel’s early films was the Surrealist masterwork L’Age d’Or (aka The Golden Age ). Budd Wilkins is a writer, film critic and instructor. He is a Staff Critic for Slant Magazine, and his work has also appeared in the Nordic Issue of Acidemic Journal of Film and Media. He is currently writing a chapter for an anthology on international horror directors to be published by Intellect Press and distributed by University of Chicago Press. Mr. Wilkins was born and raised in Hollywood, Florida. He attended Penn State for several years before moving to North Carolina in 1994, where he earned his Bachelor's in Religious Studies and a Master's in Liberal Studies with a concentration in Film Studies from The University of North Carolina at Greensboro. His primary focus is film history, film literacy and criticism, with the goal of bringing obscure, foreign and films that are labeled "difficult" to the attention of film aficionados of all kinds. Other interests and focus of critique include comparative religion, black humor, 19th century European literature, horror and graphic novels. Mr Wilkins lives in Greensboro, North Carolina with his wife, Tina. Follow @buddwilkins on Twitter. This entry was posted in film, movie reviews and tagged cinema, cinema reviews, ernest hemingway, film, film criticism, film review, film reviews, gertrude stein, kathy bates, kurt fuller, lea seydoux, luis bunuel, man ray, marion cotillard, midnight in paris, mimi kennedy, movie, movie reviews, movies, owen wilson, rachel mcadams, salvador dali, scott fitzgerald, vicky cristina barcelona, woody allen. Bookmark the permalink.